Are the best compacts as good as mirrorless cameras and DSLRs? With large sensors, top-quality lenses and advanced functionality squeezed in, is the gap between high-end compacts and interchangeable-lens cameras still there? Smartphones have successfully eaten into the space that was long occupied by budget compact cameras, and this has meant that many manufacturers have shifted their focus to the higher end of the compact spectrum. The enthusiast compact camera was always viewed as a credible alternative to a DSLRs for the kinds of situations in which the latter was impractical. Most users, however, will also have been familiar with their various limitations, and the advent of small, mirrorless cameras has also rubbed off some of their sheen. But now, in 2018, are the differences between the formats as defined as they used to be? Or are compact cameras just as good as interchangeable-lens models? The answer to this depends in large part on how exactly you define a cameras as good, or ‘better’ than another – so let’s take a look at the key points of difference. Aside from the fact that the only lens you can use with a compact camera is the one built into it, for most users, it’s the size of sensor that separates compact cameras from DSLRs and mirrorless types. Most compact cameras use sensors that are significantly smaller than those inside interchangeable-lens cameras, and this has a significant effect on how much light they can capture, and therefore use to make an image. We have, however, had APS-C sensors inside compact cameras for the past decade, and both full-frame and Micro Four Thirds sensors have also trickled down from DSLRs and mirrorless cameras at various points. Conversely, we’ve even had relatively small 1/1.7in sensors inside mirrorless cameras, although this is far from the norm and only currently exists in one such system. In short, it's possible to find whatever size of sensor you like (up to and including full frame) inside a compact camera, which gives you scope for better image quality and control over depth of field than usual – but compacts do still remain less flexible here. Read more: DSLR vs mirrorless cameras – How do they compare? 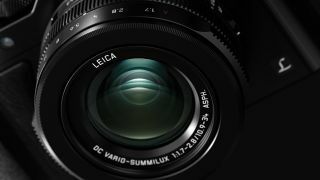 One of the main limitations concerns what the manufacturer's choice of sensor means for lenses; it’s difficult to construct cameras that have both large sensors and broad zoom ranges – particularly with relatively wide maximum apertures – which explains why so many have had fixed-focal-length lenses. Most enthusiast compact cameras have 1in sensors, and their lenses typically offer something close to 24-70mm or 24-100mm in 35mm terms. This fact, however, has meant that manufacturers have been free to optimise those lenses specifically for those models, which bodes well for quality. Indeed, many fixed-focal length compacts, such as Ricoh’s GR models, Fujifilm’s X100 line and, of course, Sony’s RX1-series of full-frame cameras, have, without question, been capable of producing images that are easily as good as those from DSLRs. This is particularly the case when the manufacturer has chosen to remove the optical low-pass filter from these sensors, a now-common practice among many different types of camera. Of course, the fact that you can’t use specific lenses on compacts as you can on DSLRs and mirrorless cameras does make them less flexible in some ways, although it’s common for high-end compacts to be compatible with conversion lenses that enable wide-angle or telephoto shooting. This arguably isn’t as flexible, but it's potentially something to think about if you're travelling and looking to stay unencumbered. Just as the lines between what type of sensor fits into a particular camera format have blurred over the years, the issue of size is similarly muddied. Compacts traditionally offer a size advantage over interchangeable-lens cameras, but some of the smallest mirrorless cameras have been considerably smaller than compact cameras around at the same time. The Pentax Q7 mentioned above is one example, as are the Panasonic's GM5 and GM1 (below). Even so, it’s important to factor lenses into this; there’s a good reason manufacturers have often paired their mirrorless models with pancake-style lenses. In terms of design, DSLRs have stayed relatively close to the kinds of modern film SLRs from which they evolved. And this makes perfect sense, as using a similar image format, and compatibility with the same optics, means there's little reason to deviate from this. In the mirrorless sector, however, manufacturers have been able to start afresh and have experimented with all kinds of designs. With many lenses typically smaller than DSLR equivalents, it's been easier to make bodies more compact while keeping a sense of proportion, and this has been a direct threat to similarly sized compacts. Unsurprisingly, the smallest mirrorless cameras have faced similar criticisms to many compacts, such as the lack of a decent grip and the effect this has on handling. again, courtesy of Pentax – DSLRs have not allowed this as an option. Compact cameras may not offer the same through-the-lens optical viewfinders of DSLRs and, at least for models that remain relatively pocketable, any possibility of using long focal lengths is typically met with a reduction to the maximum aperture available. Recent bridge-style models like Sony's RX10 and RX10 II have broken from this, delivering a large-than-usual sensor with long, wide-aperture lenses, although the end result is a camera that's close in size to that of a DSLR. Compacts have long matched DSLRs and mirrorless cameras in offering things like Raw shooting, although the flexibility of Raw files from small-sensor compacts is still behind that from a DSLR. But, of course, compacts do have various advantages where features are concerned. The use of electronic shutters, fore example, which is standard in compact cameras but only starting to make an appearance in DSLRs, means that compacts can be far more discreet in use than DSLRs. Built-in electronic viewfinders in the likes of Sony and Fujifilm compacts also provide more flexibility in low light than optical kinds, while 4K video is now far more prevalent across compacts than on DSLRs too, although this feature is rapidly expanding in mirrorless cameras. So, which works better for you really depends on what your priorities are. Aside from lenses, DSLRs and many mirrorless cameras have a raft of accessories as supporting players, and many of these tend to be compatible across many models. There's a smaller market for accessories for compact cameras, so there's less need for the same kind of options here, but the photographer that's looking to stay mobile may want to investigate just what's possible. Many enthusiast compacts have been designed with hot shoes on their top plates, and this has allowed them to accept flashguns, microphones, GPS units and various other accessories. The fact that many of these are the same ones that can be used on that manufacturers DSLRs has also been a further incentive to have one model complement the other. Purely from the perspective of image quality, there's now a significant overlap between compacts and interchangeable-lens cameras. Back when compacts offered nothing larger than a 1/1.7in sensor the difference was more significant, but this is no longer the case, and it's certainly possible to get images of the same standard from both. The caveat is that you're likely to find it cheaper to do so with a DSLR or mirrorless camera, rather than a more niche compact whose production may not benefit from the same economy of scale. It's important to think of practicalities too; regardless of its image quality, not everyone want to spend £2000/$2500 on a full-frame compact camera with a fixed lens, or even £600/$600 on an APS-C-sensor equivalent, as it's simply not suited to their needs. You may be more comfortable using a small, pocketable compact that can go anywhere with you, particular for more spontaneous or discreet shooting, but this type of photography is not for everyone. Street photographers may find it easier to shoot with a compact camera than a DSLR, but if sports is your thing, a DSLR or mirrorless model will be far more appropriate. So, are the best compacts as good as mirrorless cameras and DSLRs? In some respects, certainly. Whether they are quite right for you, however, and whether you'd be better off with an interchangeable-lens camera, is another matter.